Frankly, I was rather shocked when AutoCAD 2009 was ribbonized, but AutoCAD Civil 3D 2009 was not. Still I could easily read between the lines, recognizing the trend, and rationalize that AutoCAD Civil 3D 2010 would be ribbonized. Still I had expected the Civil 3D 2010 ribbon to be much like the AutoCAD 2009 ribbon; cool, but not especially useful for longtime users. Boy did I have a surprise coming my way! I really have to give it to the folks up in Manchester, NH (where Civil 3D is created). They did not just slap a bunch of commands on a ribbon, and wish us users the best of luck. Instead, they did their homework, and put together a comprehensive array of ribbon tabs & panels. Things like create alignment, profile, parcel, and the like are right where they belong – the Home tab. Now if that’s too hard, Civil 3D also harnesses the full power of a feature new to AutoCAD itself – the contextual ribbon. With the contextual ribbon, all one has to do is select the alignment they want to modify. AutoCAD will take care of the rest, presenting you with a contextual Alignment Ribbon Tab. Housed within the Alignment Contextual Ribbon Tab are things like the Geometry Editor, Design Criteria Editor, even a launch pad to create a profile if you wish. How awesome is that! Again, I was optimistic about the ribbonization of Civil 3D, but after having the chance to experience it for myself, it’s actually quite helpful. Generally, I find it extremely easy to locate the tools I need when I need them. Still, the commands I cannot find are often just an object selection away. I select an alignment, and AutoCAD automatically displays the tools I need thanks to the new contextual ribbon feature. Well done Autodesk, well done. Thank you very much for this usefull autocad information. While you may need to reset your CUI, it's very likely you can fix things by setting your Workspace current. Enter WSCURRENT at the command line, and then enter 2D Drafting & Annotation. That will give you the default AutoCAD Workspace where you can switch to whichever workspace you want from there. can anybody please help me with my autocad 2010. i cant see the ribbon. its blank. please please please help. I’d like to know if there is a way to attain the AutoCAD Classic Workspace in AutoCAD Civil 30 2010. I don’t see it listed as an option. Monika – Out of the box, there is not a classic workspace for Civil 3D. You can however enable the old menus by going to the CUI command. You can select on a Workspace within the CUI command, and then switch the menu bar setting to Enabled. Something worth noting is the menus in Civil 3D 2010 are really nothing more than the menus found in Civil 3D 2009. For instance, you won’t find an intersection menu (new feature in 2010). Where is the "properties" tab? 3d civil does not replace the power of land desktop, as we are told. The land desktop menus contain lots of utilities and command formats, the 3d civil menus are a mere shadow of ldd. I expect that those of us in the survey world will migrate away from 3d civil 2010, without companion it has little to offer to us. A prime example: zoom to point number is no longer a point utility routine, there are ways around this but it's cumbersome. 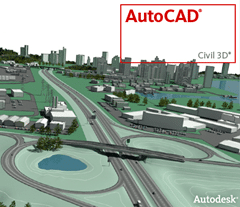 @Jose – Civil 3D is generally a little behind the AutoCAD release date. In the past it’s been as much as a month, but it looks like Civil 3D 2010 will be here sooner than later. Civil 3D es en general un poco detrás de la fecha de AutoCAD. En el pasado ha sido tanto como un mes, pero parece Civil 3D 2010 estará aquí antes que después.